CREAM POWDER (CREAM, WHEY, NONFAT DRY MILK, CORN SYRUP SOLIDS, SALT), POWDERED INSTANT MILK (NONFAT MILK SOLIDS, VITAMIN A PALMITATE, VITAMIN D3), FOOD STARCH-MODIFIED, SALT, ONION POWDER, SUGAR, GARLIC, THYME, SILICON DIOXIDE (ANTICAKING AGENT). Slowly add 1 cup mix to 2 cups hot water and stir well. Simmer for 2-3 minutes and let rest 1-2 minutes. Makes 2 cups sauce. 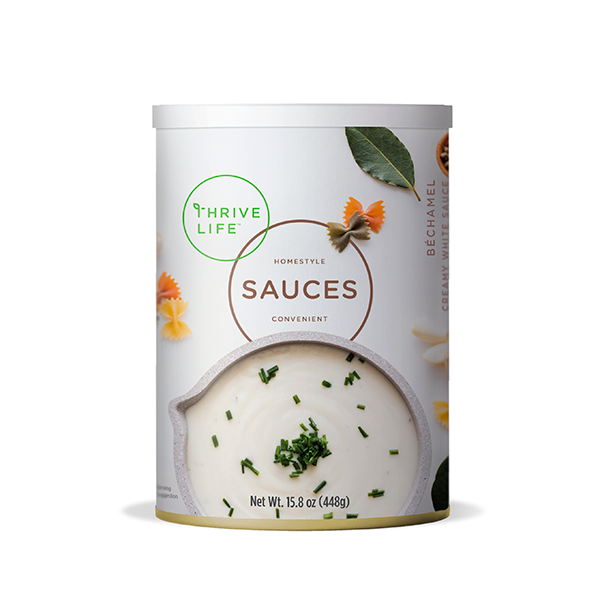 This white sauce makes tons of versatile sauces; add garlic and parmesan for Alfredo sauce, or cheddar cheese to get sauce for macaroni. It works as a base for creamy soups like potato soup, and can be mixed with our Tomato Sauce to make it creamier.